By Tuesday night, the U.S. National Hurricane Center in Miami said Maria’s winds had intensified to 175 mph (280 kph) and additional strengthening was possible. At 11 p.m. EST, Maria was centered about 30 miles (45 kilometers) south-southeast of St. Croix, or 120 miles (190 kilometers) southeast of San Juan, Puerto Rico, and was moving west-northwest at 10 mph (17 kph). Maria’s center was expected to pass several miles south of St. Croix late Tuesday on its way to Puerto Rico, prompting U.S. Virgin Islands Gov. Kenneth Mapp to ask that people remain alert. St. Croix was largely spared the widespread damage caused by Hurricane Irma on the chain’s St. Thomas and St. John islands just two weeks ago. But this time, the island would experience five hours of hurricane force winds starting about 11 p.m. EST, Mapp said. 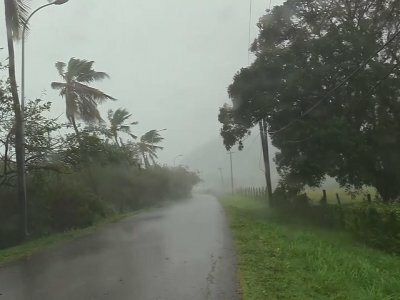 The warning came after Dominica Prime Minister Roosevelt Skerrit sent out a series of dramatic posts on his Facebook page as the storm blew over that tiny country late Monday — but then stopped suddenly as phone and internet connections with the country were cut. Maria ties for the eighth strongest storm in Atlantic history, when measured by wind speed. This year’s Irma, which had 185 mph (300 kph) winds, ranks second. Hurricane center forecasters said it “now appears likely” that Maria will still be at Category 5 intensity when it moves over the U.S. Virgin Islands on Tuesday night and Puerto Rico on Wednesday, bringing with it “life-threatening” flooding from rain and storm surge. Forecasters said the storm surge could raise water levels by 6 to 9 feet (1.8 to 2.7 meters) near the storm’s center. The storm was predicted to bring 10 to 15 inches (25 to 38 centimeters) of rain across the islands, with more in isolated areas. To the north, Hurricane Jose weakened to a tropical storm Tuesday night. Forecasters said dangerous surf and rip currents were likely to continue along the U.S. East Coast but said the storm was unlikely to make landfall. Big waves caused by Jose swept five people off a coastal jetty in Rhode Island and they were hospitalized after being rescued. Coto reported from San Juan, Puerto Rico. Associated Press writers Ben Fox in Miami and Seth Borenstein in Washington contributed to this report.